Winrock addresses some of the most important and critical issues facing the world today: agriculture and sustainability; clean energy; climate change; economic opportunity; forests and natural resource management; gender and social inclusion; water; and youth and education. Whether the topic revolves around one of these issues, or other challenges facing the world today, Winrock is prepared to offer solutions tied to the strong values that guide our work: a commitment to good science and sound economics, an appetite for innovation and new ideas, a belief in the power of knowledge to improve lives, an understanding that ideas must be proven on the ground, a commitment to equity and the empowerment of women and the disadvantaged. 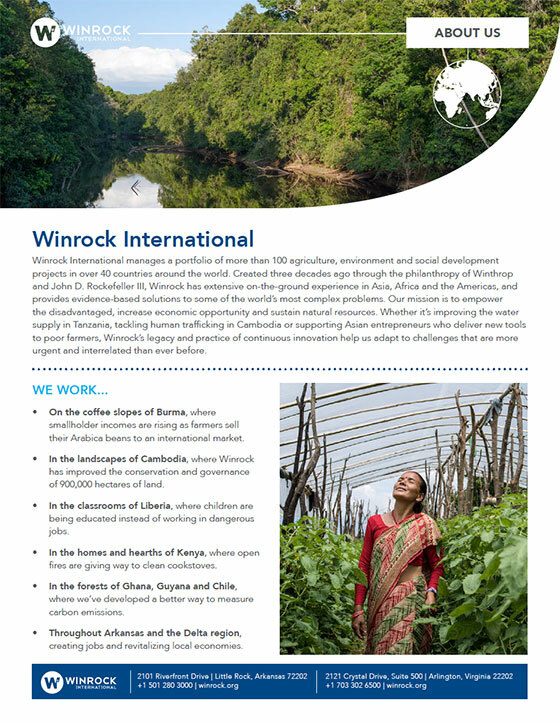 With U.S. offices in Washington, D.C., and Little Rock; regional offices in Nairobi, Kenya and Manila, Philippines; and project offices in dozens of countries, Winrock offers many unique places to do great work for a better world. If you have further questions, email us at jobs@winrock.org. Guided by our belief that organizations do their best work when individuals with different backgrounds and perspectives are fully engaged, Winrock International is dedicated to building an inclusive workplace that respects the dignity of each individual. We are committed to fostering a culture that embraces diverse perspectives, and believe that a diverse workforce broadens our understanding of the communities we serve and enhances and enriches our work. Winrock International is an Equal Opportunity/Affirmative Action Employer, and we comply fully with the Americans with Disabilities Act (ADA). We are committed to creating and maintaining a diverse workforce through our recruitment and employment practices.